Did you know that fall is a great time to apply for a new credit card? If not, allow me to explain. Many credit cards these days come with an annual calendar year benefit, such as an airline credit or a travel credit. These benefits aren’t based on when your card anniversary is – rather, they’re simply based on the calendar year so all customers are in the same boat, regardless of when they got the card. This means everyone gets a use it or lose it benefit annually, no matter when they applied for a credit card. Take the $300 travel category credit from the new Chase Sapphire Reserve card. It’s a calendar year benefit, meaning you get $300 in statement credits every calendar year. So if you applied for the card sometime in 2016, you’d get $300 in credits until December 31st. Then the credit resets on January 1st, 2017. For the savvy credit cardholder, this is an ideal time to apply for a card like Sapphire Reserve. Why? In short, you can get $300 in travel credits in 2016 and another $300 in 2017, all while only paying one annual fee of $450. Assuming you max out the credit, you’d come out $150 to the good, eclipsing that pesky annual fee and giving yourself time to enjoy the benefits of the card before canceling when the second annual fee comes up late in the year. You could do the same thing if you applied in say June of a given year, but then you’d only get six months to use the subsequent year’s credit before the next annual was due, instead of nearly 12 months. Of course, you do have to have a plan for using the credit this year to ensure you don’t miss out, or waste some of it with just a month or so remaining. But you can also use two credits in a short period (e.g. 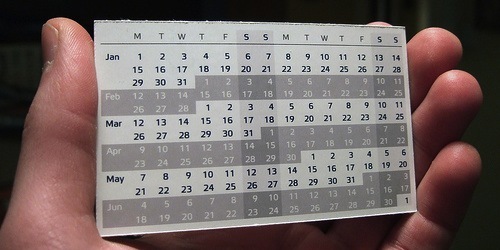 December 16 and January 17) for the same vacation, instead of waiting a year for the credit to reset. For example, book the flight in late 2016 and the hotel for that same trip in early 2017. Aside from giving yourself more time to enjoy the credit, this time of year is also a heavy spending period for most folks. That means it’s also a good time to hit the minimum spend on a new credit card. Sometimes people struggle to come up with ways to spend X amount in three months, but with holiday shopping virtually unavoidable, it’s a good way to knock out some of the burden. There also happens to be a lot of holiday travel, and since these annual credits are travel-related, it’s probably a good time to use them. Sure, you can just buy airline gift cards or take lots of Uber trips to get the credits, but it’s nice to use them for something you were going to spend regardless in one fell swoop. Anyway, once you get two year’s worth of credits, you can cancel the card while paying a single annual fee, assuming you have little use for the card thereafter. Yes, the benefits on these cards are good, but at $450 per year, most will probably balk at keeping them in their wallets long-term, especially when there are always competitive alternatives popping up. Good tip…I’m maxing out my $300 travel credit on Sapphire Reserve right now and plan to get another $300 in January! Me too…and fortunately Uber Eats works toward the credit. Free food all month long!